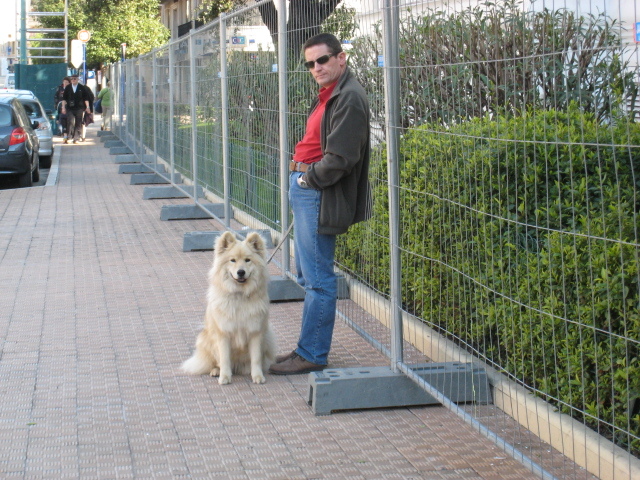 This beautiful dog was waiting opposite the entrance to the Fête du Citron in Menton. The man is probably waiting for his wife to come out as dogs aren't allowed into the display area. I'm not sure what he is - perhaps a German Shepherd crossed with a Husky. Whatever he is, isn't he beautiful? I love the dog photos! This guy looks like a samoyed -- the dog, not the man -- although it's hard to say for sure without seeing if his tail curls up. You're right about the colour. hmmmm. some sort of samoyed cross? He's a great looking dog, regardless. Merci beaucoup for stopping by Sophie's site. Please visit again!